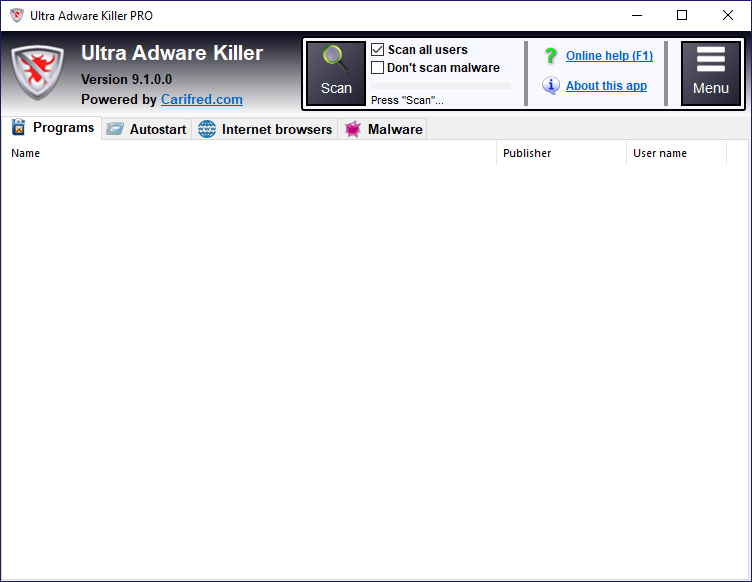 Ultra Adware Killer is a powerful adware and malware remover for Windows, which has the ability to scan all the users in a system. This can save you lots of time logging in to other user accounts and performing the scan again. It also allows to optionally reset the browsers configuration, allowing them to run as smoothly as when they were installed. If you own a PRO license, you can benefit of even more features, such as extended command line switches and scheduling automatic scans. Ultra Adware Killer is also part of our premium tool UVK - Ultra Virus killer. If you already purchased a license and it was accidentally deleted, click here to recover it. The list shows the whitelisted items. Thick the checkbox next to the items you want to remove from the list, press Delete checked and confirm. This removes the item(s) form the whitelist, meaning they will be detected again, when present. You can easily export and import the whitelist to/from an external file. This will be particularly useful to make backup copies of the whitelist, or to transfer it to a different computer. To import the whitelist from a file, press Import list and select the INI file the list was previously exported to. To export the list, press Export list and select the INI file path and name you wish to export to. The logs are very self-explanatory. The scan log contains a header with some useful system information, such as the Windows version, installed browsers' versions, and the name of the user that started Ultra Adware Killer. This information may help you to detect an outdated browser, or a missing service pack. Items found (in the scan log) or items removed (in the removal log) are ordered by the corresponding section: Programs, Internet Explorer, Chrome and Firefox. 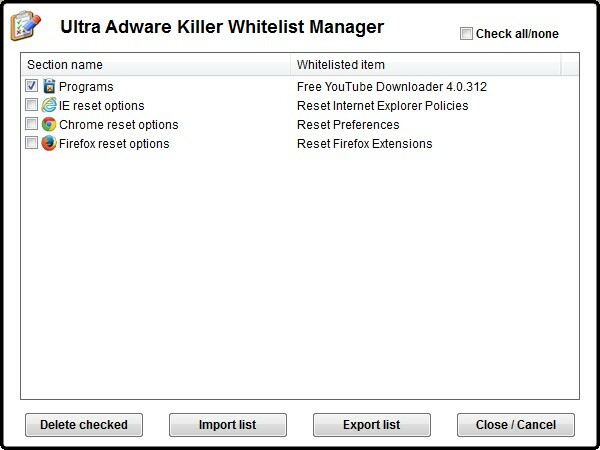 Click the About this app link to get more information about Ultra Adware Killer. /Scan - Automatically start a scan, without waiting for user input. /NoUpdate - Not to search for updates at application startup. By default, Ultra Adware Killer auto-updates itself on launch. /ScanRemove - Automatically start a scan and remove any threats detected (and ticked in the lists). /CUOnly - Do not scan all users. This will cause the Scan all users check box to be unchecked by default. /NoMalware - Do not scan malware. This will cause the applicatrion to scan for adware only. /NoRP - Do not create a restore point before starting the threat removal process. /AutoReboot - Automatically reboot the computer after the threat removal process, if needed. /Quiet - Run silently (do not show any user interface). /Quiet should be used only with /ScanRemove. The remaining switches can be used with /Scan or /ScanRemove. You can use either a slash or a dash (/scan or -scan both work). In order to bring up the Activation tab, press the Menu button, and then select Settings and activation. A dialog box similar to the picture below will be displayed. The text line below Activation status tells you whether the PRO version is activated and the user name it was registered to. 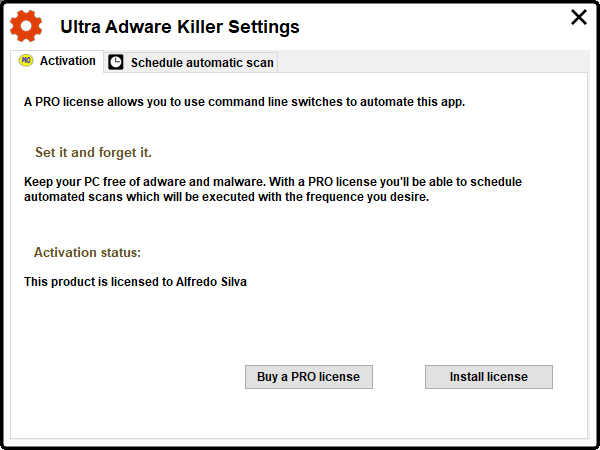 Clicking the Buy a PRO license button takes you to Ultra Adware Killer's Buy License page. If you already purchased your license and just want to install it, press the Install license button, which allows you to browse to the path where your license file (UAKKey.uak) is located and select it in order to use it to activate the application. Note that you can place the license key file in the same folder where UltraAdwareKiller.exe is located, and the application will recognise it and automatically activate when it is launched. This may save you some time. In order to bring up the Schedule automatic scans tab, press the Menu button, select Settings and activation, and then select the Schedule automatic scans tab. A dialog box similar to the picture below will be displayed. 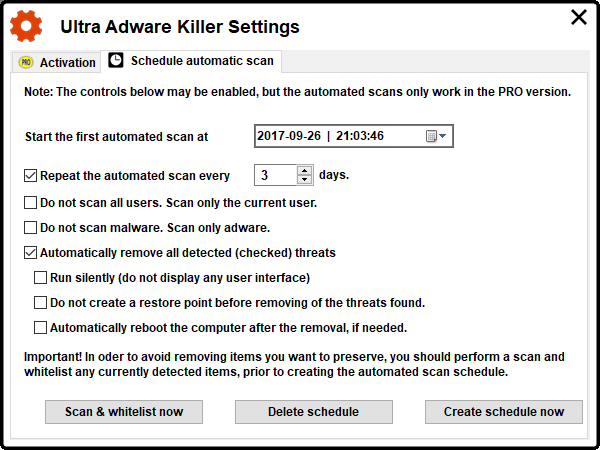 This tab allows you to schedule Ultra Adware Killer to scan your conputer periodically, and automatically delete any threats found, if desired. Select the date and time of the first scan in the date picker control. You can click the small down arrow at the right of the input field to bring up a calendar where you can select the desired date. Next, set how frequently you want the scan to be repeated. By default it is repeated every 3 days. Increatse or decrease this value to the desired frequency. You can also disable repeating the scan/removal operation by unchecking the Repeat the automated scan every check box. This will cause the operation to be executed only once. If you don't want to scan all users, check Do not scan all users. Scan only the current user. If you don't want to include the malware scan, check Do not scan malware. Scan only adware. If you want to automatically remove any threats found, Check Automatically remove all detected (checked) threats. In this case, if no threats are found, the application will simply close right after the scan completes. Otherwise, UAK will remove all the detected items that are automatically checked. Unchecked items, such as browser reset actions will not be executed. The options below are disabled unless this option is ticked. If you don't want UAK to display its usual GUI, check Run silently (do not display any user interface). Note that, in this mode, UAK will not display any user interface, and you will not be able to cancel the operation, once started. If you don't want to create a restore point before removing the threats found, tick the respective check box. Note that if no threats are detected, no restore point is created anyway. Threats that can not be immediately removed are scheduled for removal on the next system reboot. If you want UAK to automatically reboot the computer to remove those items, check Automatically reboot the computer after the removal, if needed. Note that, if no items are scheduled for removal on reboot, no reboot will ocur, even if this option is enabled. If the automatic removal is enabled, you should first run an on-demand scan and whitelist any detected items you want to keep. You only need to whitelist the items whose check mark is ticked. To quickly do this, press the Scan & whitelist now button, which will automatically start a scan with the selected options. Once the scan is complete, take a look at all the lists, and whitelist the ones you want to preserve. Once you're all set up, press the Create schedule now button. A message box will tell you whether the requested schedule was successfully created or not. You can cancel the schedule anytime by coming to this dialog box again, and pressing the Delete schedule button.